Sticky-sweet kiddie flick Heidi's Song marked a gala return to animated feature films for TV legends Bill Hanna and Joseph Barbera after a nine-year hiatus (it had been a long time since 1973's Charlotte's Web). Although it wasn't a box office or critical success in 1982 and has been in home video limbo since the '90s, the film seems to be fondly recalled by both audiences and those who made it. In fact, Hanna's autobiography devotes a good deal of admiring space to it at the expense of other, more iconic projects he was involved with at the time (Scooby Doo, where are you?). The arrival of the flick as part of Warner Archive's fun series of m.o.d. (manufactured on demand) discs offers a good opportunity to check it out again and see if this pint-sized blonde has legs. Heidi's Song doesn't follow Johanna Spyri's beloved children's book too closely. The scriptwriters actually appeared to model the film after the 1937 Shirley Temple version, which also eschewed the meditative, spiritual aspects of the character in favor of episodic scenes that highlight the girl's plucky stick-to-it-iveness. Indeed, just about the only thing that differentiates this one from the Temple version is the addition of several not-quite hummable songs from H-B's longtime composer Hoyt Curtin. Curtin's musical prowess does play a big part in the film's most memorable sequence, however, a splashy production number with the voice of Sammy Davis, Jr. as a funky rat leader who wants all the other rats to emulate his own supreme rattiness. If only the rest of Heidi's Song were that ballsy/odd. 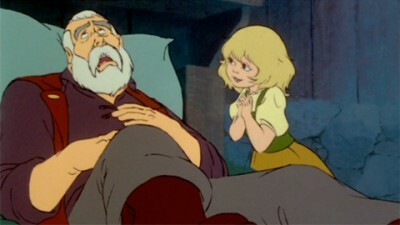 The film begins with plucky orphan girl Heidi (voiced by Margery Gray) dropped off at the remote mountain cabin of her gruff grandfather (Lorne Green) by her Aunt Dete (Virginia Gregg). The grandfather at first resents the intrusion, but Heidi's constant cheer and effervescent love of the Alpine surroundings eventually win over both him and Peter (Roger DeWitt), a local goat-herding boy. After Grandfather injures his leg, Heidi's patience and giving spirit help him heal. This segment is pure Heidi 101, and yet the filmmakers decided to insert a surreal dream sequence in which Heidi frolics with a hoard of mountain-sprites known as bobols - an intriguing scene that is set to the faint sound of Johanna Spyri spinning in her grave. Just as things reach a sugar high between Heidi and Grandpa, Aunt Gete returns and informs the two that a rich family in Frankfurt took an interest in Heidi becoming the companion for their lame child. Heidi is ushered into the elephantine mansion by the stern governess Frauliein Rottenmeier (Joan Gerber), who feels nothing but contempt for this simple country girl, and the household's Josef Von Sternberg-esque butler Sebastian (Fritz Feld). She gets a warmer welcome, however, from the sweet, frail Klara (Pamelyn Ferdin), scullery maid Tinette (Janet Waldo), and Tinette's coal-hauling boyfriend (Richard Erdman). 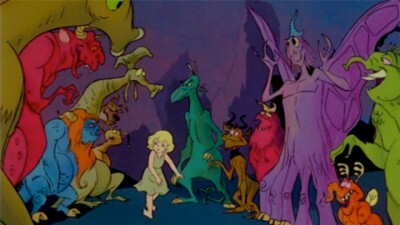 The shenanigans that erupt when eager-to-please Heidi comes up against Rottenmeier and Sebastian are as predictable as you'd expect, but the story gets spiced up with elements that could never have appeared in a live action effort - cute animals galore, and those colorful, trippy dream/fantasy sequences. 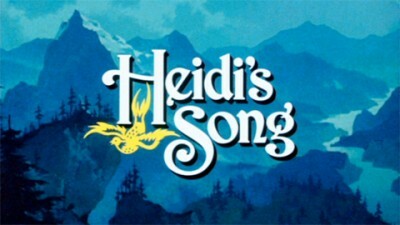 Heidi's Song makes for a decent, sugary watch for the under-7 set; for everyone else, the limitations of the Hanna-Barbera style become obvious right from the start. 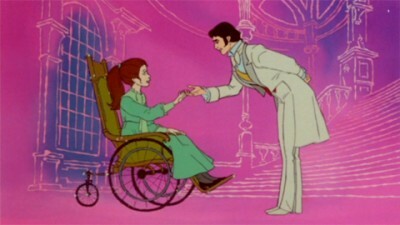 The animation, while a touch more fluid than the made-for-TV stuff H-B was cranking out at the time, doesn't come close to Disney and their "illusion of life" m.o. of carefully researched movement drawn from nature. Most distressing of all is the treatment of Heidi herself - an adorable child on paper, here she's made over into a bland-voiced blonde moppet with a mawkish look that lies halfway between generic anime girl and toilet paper spokeswoman Lil' Softy. Remember also, this came out the same year that Don Bluth's dark, complex The Secret of NIMH appeared to challenge the Disney monolith of safe, stale cute-animal animation. Hanna-Barbera could have risen to the occasion as well, but if anything Heidi's Song proved that H-B preferred to hedge their bets on an old familiar story, one as safe as (goat's) milk. Presented for the first time since its theatrical run in 16x9 widescreen, Heidi's Song is given a decent, colorful mastering on disc. The picture has a slight blur, consistent grain (especially in the opening and closing credits) and a yellowish tone with light flecks and dust. Not as good as it could have been, overall, but pleasant and watchable all the same. The film's stereo soundtrack is well-preserved here with a good balance between dialogue and music. No subtitles or chapter menus on this no-frills disc. None, not even a trailer. The cheery Heidi's Song is a worthwhile purchase for those who fondly recall seeing it in the early '80s, or if you're looking for something mildly cute 'n inoffensive to keep younger viewers occupied. Be aware that the film is sweeter than a bag of gummi bears, however. 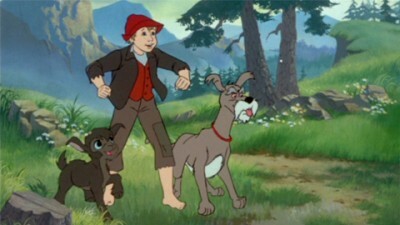 The film's sloppy animation, forgettable songs and so-so story make it at best a historical curiosity for everyone else. Rent It.